Maxillofacial Prosthetics is a subspecialty of Prosthodontics that involves rehabilitation of patients with defects or disabilities that were present when born or developed due to disease or trauma. Prostheses are often needed to replace missing areas of bone or tissue and restore oral functions such as swallowing, speech, and chewing. In other instances, a prosthesis for the face or body may be indicated for cosmetic and psychosocial reasons. Prosthetic devices may also be created to position or shield facial structures during radiation therapy. Patients that typically desire prosthetic care are those that have been in an accident, have had surgical removal of diseased tissues, or have a neuromuscular disorder from ALS or a stroke. Children can also be born without full development of ears, teeth, or palate and need specialized care. 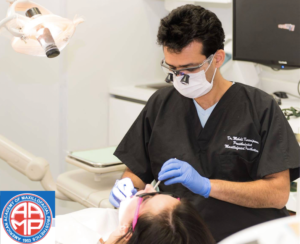 Maxillofacial Prosthodontists are accustomed to working cooperatively with ENTs, oral surgeons, general and specialty dentists, plastic surgeons, neurologists, radiation oncologists, speech pathologists, anaplastologists and various ancillary personnel. The overall goal of all maxillofacial prosthetic treatment is to improve the quality of life. Featured below are some examples of prosthetic treatment. This list is not all-inclusive. Often these prostheses are combined with traditional dental therapy to restore health, function and aesthetics to the oral cavity. This comprehensive care is possible because Maxillofacial Prosthodontists initially completed 3 years of advanced training in complex oral rehabilitation. If you believe that you might benefit from one of the following services or related treatment, please contact our Maxillofacial Prosthodontist at Modern Dentistry of Shrewsbury, MA. Interim and Definitive Obturator: Covers palate after partial or total loss of maxilla or due to cleft palate. It restores teeth and gums and has an extension which closes the defect or hole for swallowing, eating, chewing, and speaking. Physician referrals welcome. Please call our office. Please visit https://www.maxillofacialprosthetics.org for more information.